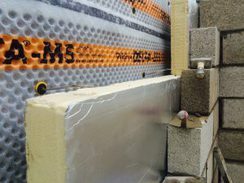 New-build housing projects require a combination of different types of waterproofing systems, as defined in BS8102:2009 - Protection of Structures Against Water from the Ground (Type A barrier, Type B integrally watertight, Type C drained protection). The current motivation for this “dual system” approach has been provided by the condition that NHBC imposed from January 2016 in their revised technical manual “Chapter 5.4”, that stipulates that, where a Grade III habitable environment is to be created internally, then two waterproofing systems must be used where the “below ground wall retains more than 600mm, measured from the lowest finished floor level” (simplified for inclusion here). Interestingly, other warranty providers such as Premier Guarantees and LABC do not actually stipulate this as a condition in their technical manuals, but the use of combinations of systems is nothing “new” and is outlined as a consideration in BS8102:2009. It is therefore taken as read that, for a system protection a Grade III environment to achieve a third party warranty from any of the main providers, it will need to comprise a combination of not less than two systems. The principle warranty providers also stipulate that a “waterproofing design specialist” should be included as part of the design team (derived from BS8102:2009) and that the specialist should be “suitably qualified” and should also hold the academic accreditation CSSW (Certified Surveyor in Structural Waterproofing). The principle of using a combination of waterproofing systems to protect high standard internal environments is well founded. BS8102:2009 asks us to consider the “scope for less than adequate workmanship” under building site conditions, the “form and feasibility of remedial works” should a defect occur, and “ the scope for testing during construction” which is invariably impractical to achieve until after the building has been finished and back-filled. The principle that “perfect” workmanship is not realistic to attain under building site conditions was established in the landmark high court ruling during the “Outwing v Thomas Weatherald” case, which now forms established case law. It was held that it was unreasonable to expect a single sheet waterproofing membrane to be installed without defect. Given the above considerations, it is clearly unrealistic to rely upon a single waterproofing system where the consequences of failure would be dire and the benefits of using a combination of waterproofing systems to design out risk are obvious. Delta offers a complete service from CSSW qualified specialists for design advice, a full range of high structural waterproofing quality products, and a network of Delta Registered Installers to install them correctly. The projects illustrated here use the quality products from the Delta Köster ranges in designs that fully conform to guidance given in both BS8102:2009 and Warranty Provider technical manuals. Consideration was given to product suitability and performance characteristics as part of the design process, as well as practicality of installation. This is part of the BS8102 that states that an integrated solution should be achieved that answers all project constraints. We ensure that our Delta Registered Installers have the opportunity to be fully trained on design methodology and product installation techniques as part of our Delta Training Courses. These are held on a regular basis at our unique head office training facility and we are also renowned for our solid technical support in the form of site visits. In all cases, design rationale was put forward by CSSW qualified Delta Consultants, with consideration given to installation by Delta Registered Installers. Keeping all parties including Warranty Providers, architects and other members of the design team up-to-date resulted in fully integrated solutions which satisfied all parties.